How many of us stare and drool at all the beautiful photos of the latest subscription box? 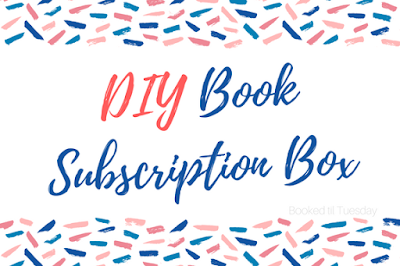 Between Fairy Loot, OwlCrate, Uppercase, Once Upon a Book Club, BookLoot, LitJoy Crate, Whimsify, SpearCraft, Book Boyfriend Box, Unicorn Crate, Shelflove Crate, My YA Reading Club, LitCube, HootLoot, and more, they're everywhere. It's all the excitement of opening your Happy Meal toy, but, you know, for teens/adults. ;) And they're so pretty! But, they're pricey. Most of these boxes are around $30 plus shipping. Yikes! Between those numbers and my general pickiness with books, I probably won't be getting one of these preciouses unless I win a giveaway or something. Step 1: Pick your "anchor item"
You can pick a theme ahead of time and try to find books/goodies to match, but I think it's easier to start with one main item and build your theme around that. I'd recommend starting with the book. Whether you're working off someone's wish list, or trying to keep costs down by getting a book on sale (or from a discount seller like BookOutlet, Dollar Tree, etc. ), the book is probably the hardest item to substitute out. Once you have your book, pick a theme for your box. Books have a LOT to them (cover, color, theme(s), genre, characters, scenes, etc.). Be creative, but I recommend choosing a broader category. E.g., "summer/outdoor romance" instead of "people who fall in love while running from bears," so it's easier to find related goodies. Step 2: Pick your "box"
Technically, you can do this at any point in the process. For me, it's helpful to get a clear visual up front of how much space I have to fill. It also helps prevent over-buying. You can have a lot of fun with this too! While an actual box is probably best if you're mailing it, there's nothing saying you can't experiment with other containers or even wrapping. I've been looking for an excuse to use these Dollar Tree plastic popcorn bins, and I love the look of old school brown paper and twine. If you're including a scarf or blanket, why not wrap the rest inside like a magical pillow? In addition to the book, it's nice to have one "special" item. Something that makes it more of a personalized gift and less of a box with a book and a bunch of junk thrown on top. This could be specially tailored to the recipient's interests (like a favorite movie or makeup). It could be a more expensive item than the rest (though that's certainly not necessary). It could also be a specially ordered item not available in stores (Etsy has a billion options), or something homemade. This could be the perfect chance to try all those crafts and recipes you've saved on Pinterest! These are all the little space-fillers and smile-bringers! They don't have to be expensive or one-of-a-kind. They just have to fit the theme and be things your box recipient will like. Candy, stickers, bookmarks, small jewelry, tea, coffee, pens, chalk, toys, crosswords--it's all fair game! This is where you put your mark on the box. Ideally, you've been tailoring all your items to the recipient, whether that's you or someone else. However, especially if you're doing this for something like the #OTSPsecretsister project, you want a little something extra that says "I am not one of hundreds off an assembly line! I am unique and just for you!" This might be a letter, a postcard, a photo, a homemade cookie, a drawing, a special style of wrapping/arranging the box's contents, or even decorating the box itself. What do you think? Have you ever made a DIY book subscription box? Or have you participated in #OTSPsecretsister before? Any tips? If I was ever gifted with a DIY book box, I can't even explain how excited I would be. Like, it would be so much fun. I have tried a couple of the subscription boxes over the last couple months. I've tried LitCube and Once Upon a Book Club, and I have Spearcraft and LitJoy boxes coming this month. My biggest problem with them has been that I haven't liked the books in the boxes I have gotten thus far. They seem like books that the book subscription companies could get cheaply in bulk. I haven't been super impressed so far, but opening the box is a blast. It's like Christmas. So I'm going to try a few more different boxes to see if I can find any I really love. "Christmas" is the perfect way to describe the atmosphere I feel when people start posting about opening their boxes. I've really considered trying one or two subscriptions, but no money, and I'm really afraid I wouldn't like the books they pick. I hope you enjoy the next two boxes, books and all! This is too perfect! 1. I am so excited you are participating in #otspsecretsister 2. I was so planning on doing stuff like this for my #otspsecretsister because it is exactly what I would want! Thank you, Ashley! I'm super excited, too! Can't wait to see the cheer packages you give and receive; I'm sure they'll be amazing! I love this post, it's wonderful! And it's basically how I build most gifts I send to friends/family haha- one main item, a food/dessert item, something cute and related. And this is super great for secret sister! One of my favorite box themes that I made for someone was Princesses; I did a Summer box too and an Easter box :) I like making themes.